About "Fatal Exchange (#02 in Southern Crimes Series)"
Customer Reviews For "Fatal Exchange (#02 in Southern Crimes Series)"
Emily Hunt is Rafael's history teacher at the prestigious Dogwood Academy, where he is a scholarship student, but now she and her niece, Tess, are his hostages. Meanwhile, Mason works with Emily's sister-Tess's mother-to negotiate with Rafael before anyone gets hurt. But who is behind the kidnapping? 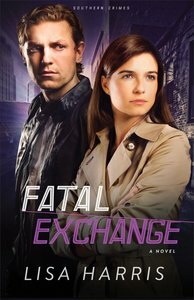 Fatal Exchange is fast-paced romantic suspense. Most of the action takes place over the course of a single day, and there are no end to the twists and turns as Mason and Emily work to resolve the situation from their different positions. There is also a sizzling romantic undertone between a couple who have known each other for years but have never dated because of Emily's aversion to dating a cop-and because Mason didn't share her faith. I thought the way their relationship was handled was excellent. And the teaser at the end ... I'll be waiting for the next book with bated breath.